Kitchen and bath design has become a passion of mine over the past few years. In fact, I would love to earn my NKBA license and become a kitchen and bath design professional someday...I'll add that to my ever growing to-do list! This bathroom is one of the most unique designs I have ever seen! 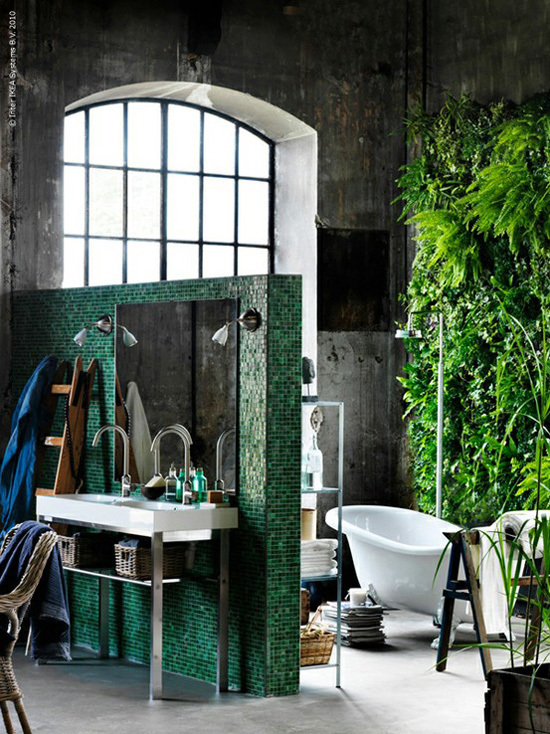 I love the finishes and special touches, like the 15' high wall of greenery next to the tub! I wish I could find more photos of the space, because it looks like the bathroom is all part of an open studio floor plan, which is completely awesome, unless of course you need a little privacy! I am slowly moving forward on my master bedroom plan. A big thanks to all of you who gave some input on my grey & yellow color pallet! I love the idea of using neutral furniture pieces and then adding pops of color through accessories and throw pillows. This way, I can change things around a bit, if I ever have second thoughts about my color choices. 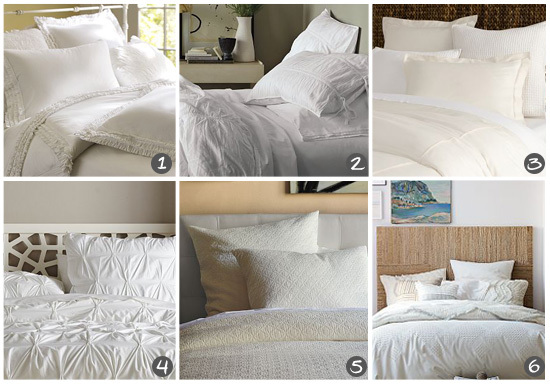 I've decided to go with all white bedding but I can't decide which set I like best. Out of the 6 choices above, which is your favorite? (I realize they may be hard to see, so click on the links below to view larger images). I like bedding #2. I love white bedding! And I'm really digging all of that greenery by the tub! I'm loving #5 - great texture! It looks old world-y and modern at the same time. I luuuuuv the texture in #4. And that bathroom is amazing! That greenery wall rocks - I just bought out the indoor plant section of Home Depot this week and am loving feeling all tropical indoors. I recommend checking out TJMaxx for your bedding. When I redid my bedroom (also has gray walls) I bought a fancy duvet thingee only to find a lovely one at TJMaxx for 1/10th the price. Have fun! About #4...first, this set by West Elm is ON SALE right now by 20% so you're in luck (if you choose this one). (I'm a little bitter, because I waited 3 months to buy it, hoping it would go on sale. Needless to say I paid full price. Boo!) Anyway, the texture and tone of the white are quite lovely and overall I'm pleased with it. BUT I'll warn anyone considering purchasing this duvet: it takes eons to iron prior to enjoying it on your bed. I'm constantly worried about getting anything on it, should I have to wash it and go through 4 nights of ironing it again. If you get it, enjoy it. But fair warning! I have the West Elm Pintuck in amethyst. Got it last year...and I do love it. I wish it puffed up a bit more, but I suppose that could be fixed with a fluffier down comforter. Also, the threads holding the pintucks together can rip if you tug on the comforter to abruptly/hard...just thought I'd mention that!